Failure to maintain coverage as required by each state’s laws can result in fines and penalties. As an employer, what are your responsibilities for maintaining coverage and communicating information about workers’ compensation and disability? What is covered? Who is covered? And if an employee becomes ill, is injured, or needs to take time off for Paid Family Leave, how do you file a claim? WHAT IS COVERED BY WORKERS’ COMPENSATION? Work-related injuries that an employee sustains during the course of their employment while on the job working. There are some injuries however that may not be covered by workers’ compensation. WHO IS COVERED BY WORKERS’ COMPENSATION? Employers are required to carry workers’ compensation insurance in all states for employees who are eligible for coverage. Definition of a covered employee will vary based on each individual state’s laws. WHAT IS THE DIFFERENCE BETWEEN AN EMPLOYEE AND AN INDEPENDENT CONTRACTOR? Independent contractors and employees often work side by side at the same company, even doing the same or similar work. However, there are very important legal differences between the two that go way beyond job titles and there are serious risks involved with worker misclassification. How can you determine if your worker should be classified as an employee or an independent contractor? IF AN EMPLOYEE BECOMES ILL, IS INJURED, OR NEEDS TO TAKE TIME OFF FOR PAID FAMILY LEAVE, HOW DO YOU FILE A CLAIM? Different forms and processes are required for each circumstance and situation. SAFETY AND LOSS CONTROL TIPS. Even the most safety conscious organizations are not immune to workers’ compensation claims. Accidents happen, but employers who play an active role in establishing protocol in how to handle these accidents will help reduce the long-term injuries and minimize overall loss. A safe workplace environment is created when production teams communicate safety tips and encourage their teams to make safe decisions during their daily work. 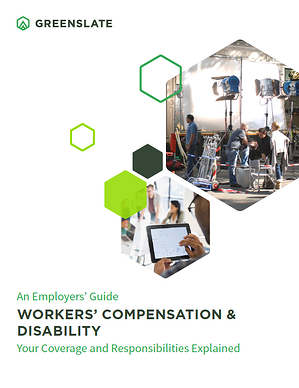 Download the ‘Employers’ Guide to Workers’ Compensation & Disability: Your Coverage and Responsibilities Explained’ and for more safety and loss control tips, check out our ‘Top 10 Work Safety Tips That Production Companies Should Know.’ blog. By making loss control visit(s), evaluations and/ or recommendations, or providing safety materials, GreenSlate, LLC has not and does not undertake or assume any duty to you or anyone else, including but not limited to: A) Identifying or reporting upon any hazard at your premises; B) Managing, controlling, or correcting any hazard; or C) Enforcing compliance with any local, state, or federal safety or health law. Our recommendations or safety materials may not address every possible loss potential, code violation, or exception to neither good practice nor will compliance with any submitted recommendations guarantee the fulfillment of your obligations as required by any local, state, or federal laws. Loss Control is a daily responsibility of your management. You are urged to implement and maintain your own safety and health management programs.